You are here: HomenextPeoplenextRecreation and EntertainmentnextBooks of InterestnextA Portrait of Basildon Plotlands -The Enduring Spirit. Written by Deanna Walker and Peter Jackson. 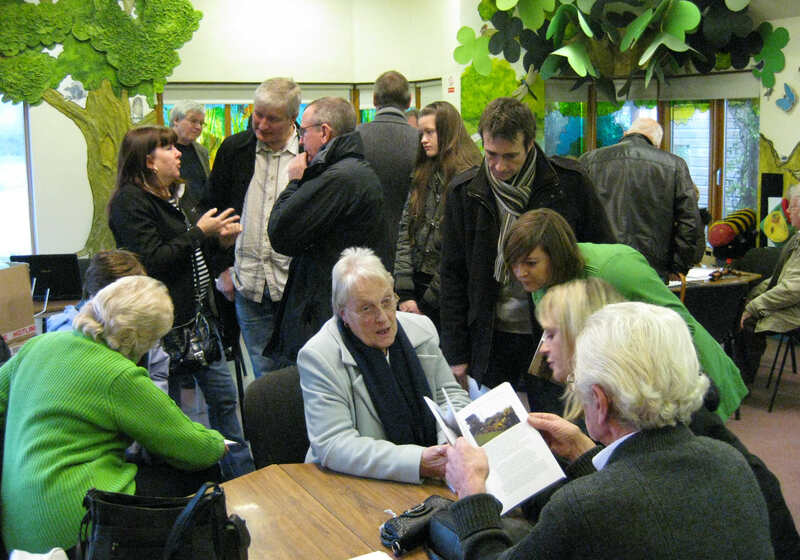 The book launch 17th/18th November 2010. Deanna and Nina with the first edition hot off the press. Deanna and Peter at the book signing. Another copy about to be signed. This book is very special to me because chapters 7 and 8 feature my home and family. 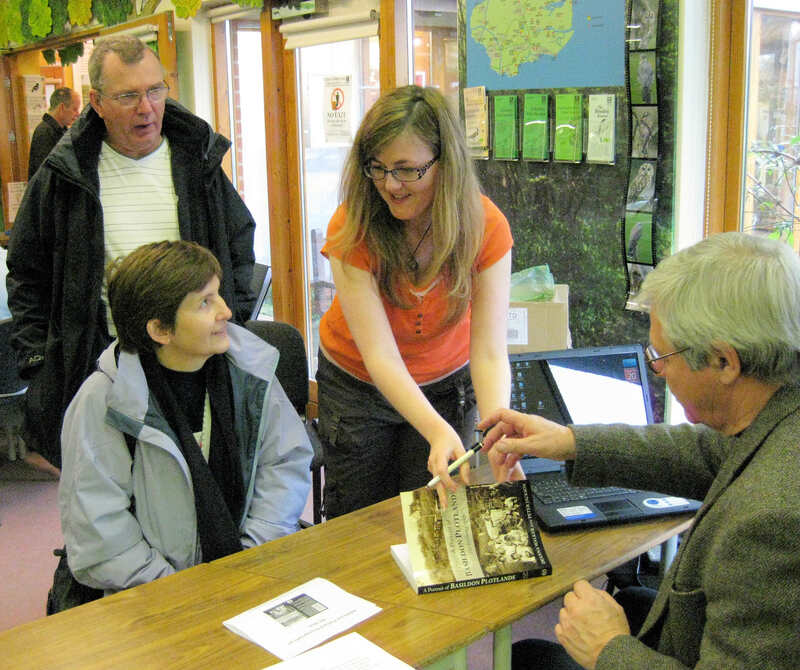 After having told Deanna how much I had enjoyed reading her first book “Basildon Plotlands. The Londoners’ Rural Retreat”, she invited me to submit a contribution towards a second book she was planning to write with co-author Peter Jackson, called “A Portrait of Basildon Plotlands. The Enduring Spirit”. This resulted in me rushing home from work each day to tap out memories and stories on my PC. Deanna and I sorted through my old family photos and made visits to the featured area. Although thoroughly enjoyable, all this was quite hard work and gave me an insight into exactly what is involved in producing a book. Having begun in April 2009, the final draft was submitted to the publishers exactly one year later. They were hoping to have the book ready for launch in the Autumn of 2010 so we kept our fingers crossed throughout the summer hoping they wouldn’t change their minds. Deanna would like to have included even more material but the publishers put a restriction on the number of words and photos that could be included. 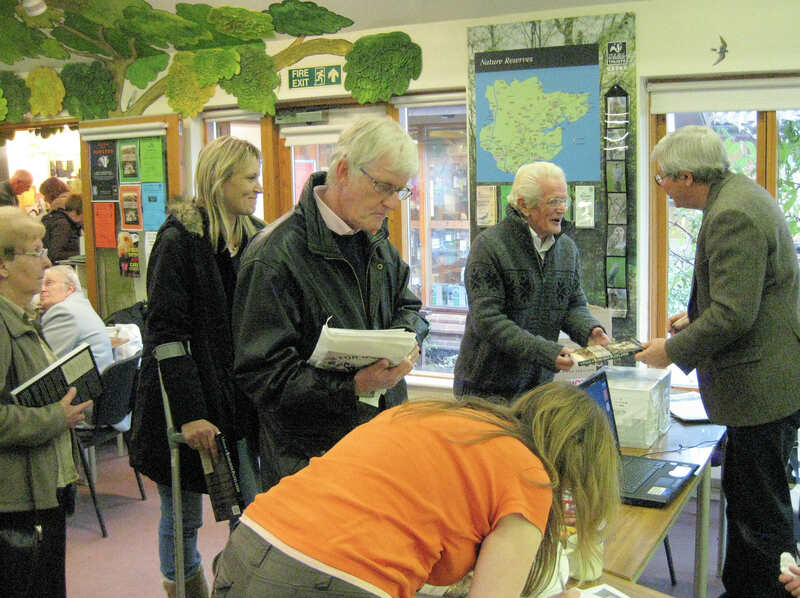 Eventually the launch took place on the weekend of 17th and 18th November 2010 at the Dunton Visitor Centre. Saturday in particular was a very exciting and successful event. Dozens of people came along including some of my family who had travelled from far and wide. 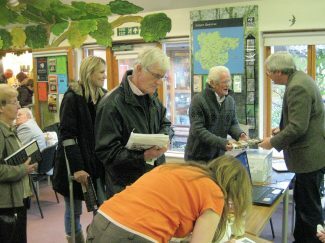 The atmosphere was buzzing as people queued to have their copies of the new book signed. ‘Portrait’ was selling so well that at one point we feared we might run out of copies. Sunday was also successful, slightly less busy but with a steady flow of people. In the afternoon, a group of us donned our wellies and went for an enjoyable walk around the area of my old home as described in the book. I later heard that around 150 books were sold over the launch weekend. Deanna recently told me that 550 copies had been sold by September 2011. On 11th January this year, armed with a map and some photographs, I showed an interested reader around the area pointing out many of the things featured in the book. We particularly enjoyed standing in my nan’s former back garden (now overgrown) in the exact spot shown on page 81 of ‘Portrait’ where I am standing with my cousin. Amazingly, my nan’s well is still there and in my mind’s eye, I could imagine her drawing a bucket of water. I intend to return at least a couple more times this year. 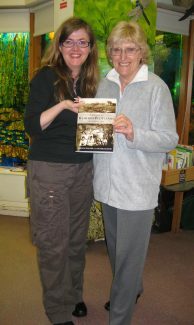 Both Deanna’s books, which are on sale at the Essex Wild Life Trust Visitor Centre at Dunton, contain not only her own very interesting memories and stories of the plotlands, but those of many other plotlanders that she collected over several years. These two local history books would make an excellent addition to any collection.